I am going through a dry period spiritually. I cannot write inspirational (let alone inspired) pieces these days but I still want to write informative articles. The 2-mile linear accelerator (linac) at the SLAC National Accelerator Lab near the Stanford University just west of its main campus is a familiar sight to motorists who pass over it on Interstate 280 near Sand Hill Road in Menlo Park. SLAC was founded in 1962 and its linac was operational in 1966. For many years the linac was used for particle physics experiments. The findings of these experiments resulted in 3 Nobel prizes: 1976 prize for the discovery of the J/Psi particle, 1990 prize for the discovery of the quarks structure in protons and neutrons, 1995 prize for the discovery of the tau lepton. SLAC is no longer a particle physics research facility. SLAC is now mostly dedicated to advanced research in Chemistry, Biology and Materials Science. You can read about the SLAC research programs here. Information about current facilities can be found here. SLAC is operated by the Stanford University for the US Department of Energy. Over the years different types of accelerators were built: synchrotrons (PEP, PEP-II, SSRL ) and a unique electron-positron collider called SLC that used the linac as the primary component. There is no doubt that SLAC is one of the centers of excellence in accelerator/beam physics and technology in the world. Starting in 2006 a free electron laser was built at SLAC in the final kilometer of the linac. The facility is known as LCLS. The purpose of this facility is to produce very short (femtosecond) pulses of hard x rays to take pictures of very fast phenomena occurring at the atomic/molecular level. The laser’s wavelength ranges from 0.13 to 6.2 nm which is similar to the width of an atom. LCLS scientists will produce accurate 3-D images of complex molecular structures. That’s the goal. Based on the success of LCLS to date, DOE (US Department of Energy) decided to fund research in chemistry, materials, and biology using an advanced x-ray free electron laser. DOE recently approved a billion-dollar upgrade to LCLS. The new facility will be known as LCLS-II. The first kilometer of the old linac will be replaced with a state-of-the-art superconducting-RF-cavity linac. Over the past several months all equipment (699 tons in 106 truckloads) were removed from the first 1 km of the structure. LCLS-II adds a new, 4 GeV superconducting linac in an existing SLAC tunnel, avoiding the need for excavation. Increases the repetition rate from 120 pulses per second to 1 million per second. It will be the world’s only X-ray free-electron laser capable of supplying a uniformly-spaced train of pulses with programmable repetition rate. Provides a tunable source of X-rays, by replacing the existing undulator (used to generate X-ray laser pulses) with two new ones. This ability to tune the X-ray energy on demand will enable scientists to scan across a wide spectrum – opening up new experimental techniques and making efficient use of the valuable beam time. Provides access to an intermediate X-ray energy range that is currently inaccessible with LCLS, but which is likely critical for studies of new materials, chemical catalysis and biology. Extends the operating range of the facility from its current limit of 11 keV x-rays to 25 keV. Maintains the existing copper-based warm linac and upgrades parts of the existing research infrastructure to take advantage of the new configuration. The future of particle physics depends on the success of plasma wakefield acceleration technology. In the future, it will be possible to accelerate electron/positrons to very high energies in much shorter linear accelerators using plasma wakefield acceleration techniques. In the final week of CERN’s accelerator operations for 2016, the AWAKE collaboration has observed strong modulation of high-energy proton bunches in plasma, signaling the generation of very strong electromagnetic fields. This is the first step towards the goal of using the proton-driven plasma wakefield technique to accelerate electrons. In the next step, a second beam of electrons – the “witness” beam – in the right phase behind the proton beam will be injected into the same plasma column. This witness beam will be accelerated just as a surfer accelerates by riding a wave. 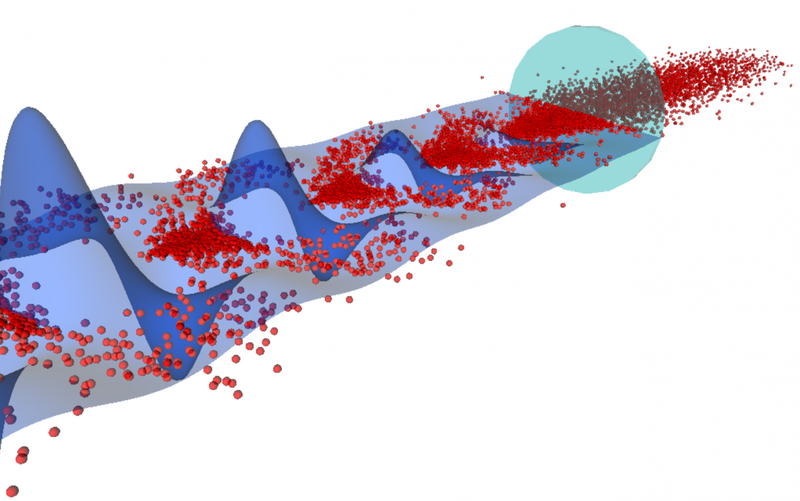 This entry was posted in physics and tagged free electron laser, LCLS, plasma wakefield acceleration, SLAC, Stanford University. Bookmark the permalink.